I am still thinking about the music festival at Wisteria. While my portion may not have gone well, there were lots of things about the festival itself that were fun and entertaining. It is often the small, people centric things that capture me at a gathering like this (because I expect the music to be entertaining) and make me smile after the fact. One hot, muggy afternoon I had dragged myself into the shade to read and wait for Megan. 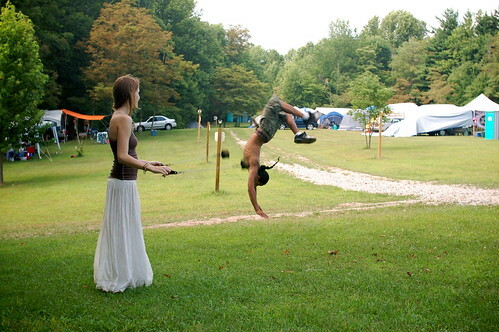 I read for ten minutes or so, then A~ walked over and asked if I would mind if she spun poi there too. Naturally I said that was fine. Spinning poi leads to spinning fire, which is always good, and well, just look at her. Why would I mind? A few minutes later her dad, Eric, walked over to join us. 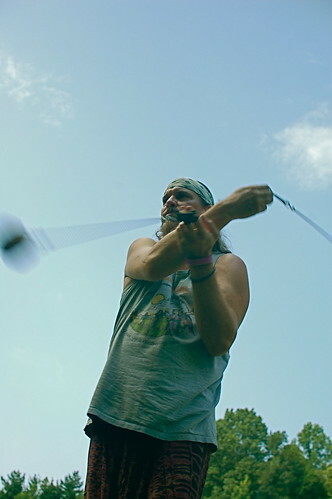 It seems he was working on his own poi technique and wanted to get some pointers from A~. She was pretty good at breaking down the motions he was trying to get, and was able to demonstrate them in a way that he was able to learn. During that same time, a pack of young men sniffed over to hang out and, more to the point, strut for A~. It was pretty entertaining. There was fencing with sticks, some feeble attempts at spinning (though one of them was actually pretty good at spinning fire), and other feats of derring-do accompanied by sidelong glances at A~ to see if she was noticing. I am sure she did, but not with any significant interest. At least one of the guys was going to great lengths to show off! He was very strong and agile, and had all the requisite skills: Spinning fire, saggin', and studied nonchalance. With a bit more maturity under his belt he will be devastating. But then, so will she. In a funny bit of closure, when the feats quit being backflips they went to things like one-handed cartwheels and moves born of capoeira and break dancing. Things that are the stock in trade of a contact improv dancer. I dusted myself off and joined him, move for move for about a minute. And then without a word, all the young dudes wandered off. I am guessing that when a geezer busts the same moves, it's time for the posse to beat feet. Leaving me with A~.